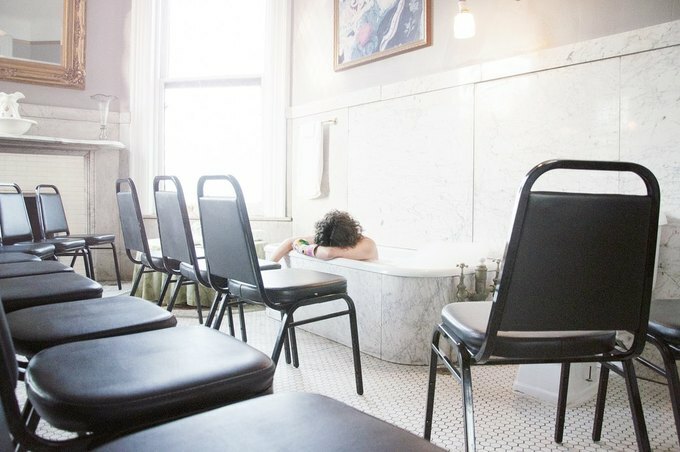 This One Woman Show Performed in a Bushwick Bathtub Is a Must-See! The award-winning immersive performance "Broken Bone Bathtub," by Siobhan O'Laughlin is playing in a Bushwick apartment until February. As a theater lover living in Bushwick, I have found myself watching performances in the strangest of locations, such as a dance piece performed in an abandoned hospital and a site-specific circus event that took place in a water tower. 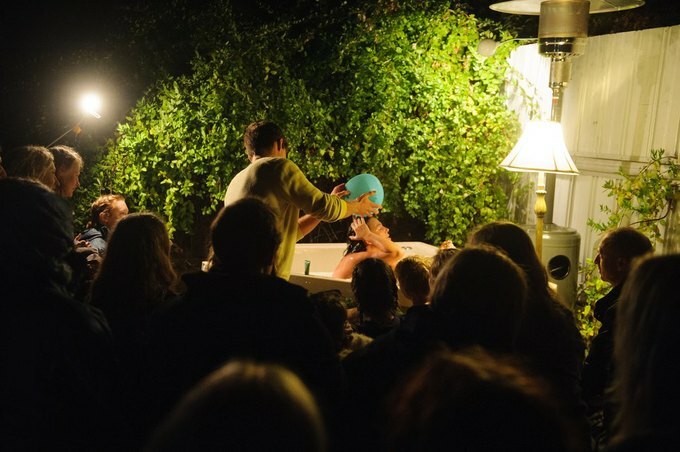 This past weekend, I saw a one woman show performed in a bathtub. Siobhan O’Loughlin's self-penned aquatic monologue, "Broken Bone Bathtub," was a rare and intimate treat: Intimate in the sense that five of us were crammed into a bathroom together, but also intimate in terms of the powerful show that evolved from the tightest of quarters. O’Loughlin sat naked in the bath with a cast on her arm as we entered the room. She began by telling us that she had been involved in a bicycle accident after colliding with another cyclist in Brooklyn. As a frequent faller-offer of bicycles myself, I could certainly sympathize with this, but as O’Loughlin lay sprawled out on the bike lane, she recalled that while the other cyclist was being cradled in the arms of her boyfriend, she, O’Loughlin, was alone. “Have you ever felt alone?” she asked an audience member who seemed flustered at first, before candidly shared an experience of loneliness. Thus the tone was set for this interactive show. O’Loughlin bravely revealed details from her own heart and psyche and asked us to do the same in return. The questions she asked us were bold and personal at times, but by opening herself up first, she had created a safe space in which we could all be honest. One theme she explored was asking for help. After her accident, she found bathing to be a huge challenge and realized that showers would not be an option. Having no bathtub of her own, she relied on friends with tubs to help her bathe. In the performance, an audience member is called on to actually wash her hair, an incredibly intimate act to watch and participate in. Without revealing too many more details about the show, I will say that good theater often feels like mirror being held up to one’s own life. Seeing narrative played out in front of you can make you question your own reactions to love and life’s challenges. This was good theater. O’Loughlin didn’t make you wait until you were walking to the subway to reflect upon the show and its themes; she asked you to do so as you went along. Each story she shared was an opportunity for self reflection. I left that steamy bathroom not only with open pores, but with an open heart too. How many Saturday nights in Bushwick can offer you that? "Broken Bone Bathtub" will play at apartments in the following neighborhoods on the following dates. For more information and to buy tickets, head to BrokenBoneBathtub website. All Photos courtesy of Broken Bone Bathub.